TORONTO – This is a sifting-through-the-sand kind of September for the Toronto Blue Jays. And while the jockeying for jobs on the 2019 club is already underway, the more immediate race is among players seeking to keep their spots on the 40-man roster. Some difficult asset-management decisions loom for general manager Ross Atkins and the front office this off-season, as several worthy minor-leaguers must be added to the 40-man or get exposed to other clubs in the Rule 5 draft. Compounding the challenge is that the Blue Jays won’t have much natural turnover on their 40 at season’s end, as the only pending free agents remaining on the club today are Marco Estrada and Tyler Clippard. That will clear two spots, but once you factor in that Troy Tulowitzki, currently on the 60-day DL, must be reinstated, and that Julian Merryweather, the player to be named later coming over from Cleveland for Josh Donaldson, is a 40-man player who also must be added, the room immediately disappears. Space will need to be created then, which is in part why the Blue Jays are carrying an active roster of 36 players (including Russell Martin, who is on paternity leave), trying to gain as much insight as possible into those on the bubble. Pitchers (19): Danny Barnes, Joe Biagini, Ryan Borucki, Tyler Clippard, Marco Estrada, Jose Fernandez, Sam Gaviglio, Ken Giles, Taylor Guerrieri, Mark Leiter Jr., Tim Mayza, Thomas Pannone, David Paulino, Jake Petricka, Sean Reid-Foley, Aaron Sanchez, Justin Shafer, Marcus Stroman, Ryan Tepera. Catchers (4): Danny Jansen, Luke Maile, Russell Martin, Reese McGuire. Infielders (8): Aledmys Diaz, Brandon Drury, Lourdes Gurriel Jr., Justin Smoak, Yangervis Solarte, Rowdy Tellez, Devon Travis, Richard Urena. 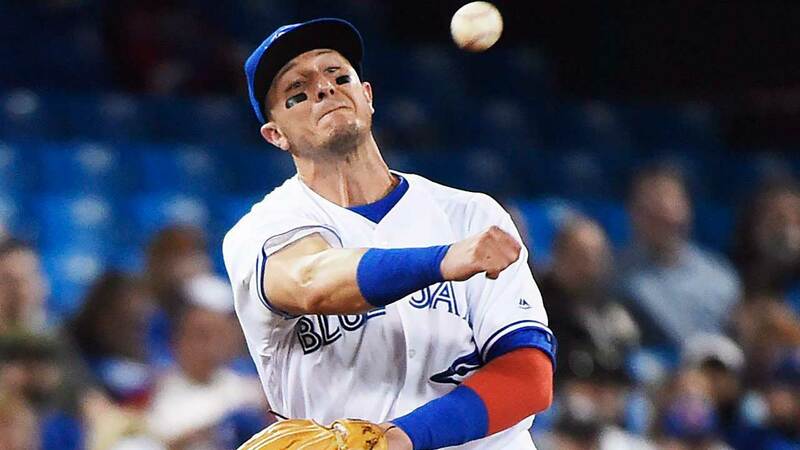 Outfielders (8): Anthony Alford, Jonathan Davis, Randal Grichuk, Teoscar Hernandez, Billy McKinney, Kevin Pillar, Dalton Pompey, Dwight Smith Jr.
60-Day DL (2): Troy Tulowitzki, Rhiner Cruz. Pending Free Agents (2): Marco Estrada, Tyler Clippard. Free-agency aside, other ways the Blue Jays can clear space on the 40-man roster short of designating a player for assignment or making trades is by declining club options and non-tendering arbitration-eligible players. Club Options: The Blue Jays have two club options for next season – on Justin Smoak ($ 8 million or $ 250,000 buyout) and Yangervis Solarte ($ 5.5 million of $ 750,000 buyout). Smoak’s option, even after he reached a couple of escalators that pushed the price up by $ 2 million, is getting picked up. There’s too much value there and he’s one of the few offensive players on the roster capable of providing Vladimir Guerrero Jr., who’ll be up at some point next year, some support in the lineup. Solarte is a far more interesting debate, as the addition of Brandon Drury, growth of Aledmys Diaz and emergence of Lourdes Gurriel Jr., appear to have made him somewhat of a redundancy. His money could also be reallocated to an area of greater need, particularly the starting rotation. Arbitration Eligible: The Blue Jays right now have nine players eligible for arbitration: Marcus Stroman, Aaron Sanchez, Ken Giles, Kevin Pillar, Randal Grichuk, Devon Travis, Ryan Tepera, Brandon Drury and Jake Petricka. A 10th, Joe Biagini, is likely to qualify as a Super 2 player, a cutoff that Luke Maile and Aledmys Diaz are likely to just miss. Arbitration spikes the salaries of players under club control, but teams have the option of “non-tendering” a player they believe will earn more in arbitration than he’s worth. The Blue Jays don’t have obvious non-tender candidates among that group, so barring some trades, they aren’t going to find lots of 40-man space within that group. Rule 5 eligible: Minor-leaguers signed at 19 or older and have played pro ball for four years and players signed at 18 or younger with five years in pro ball must be added to the 40-man roster or be exposed to other clubs in the Rule 5 draft. A simpler way to think about it is college players drafted in 2015 plus high-schoolers drafted and international free agents signed in ’14 are those who are newly eligible this year. Notable Blue Jays minor-leaguers to fit that criteria include: Hector Perez (acquired from Houston in the Roberto Osuna deal), Patrick Murphy (named Florida State League pitcher of the year after starring at Dunedin), Yennsy Diaz, Jon Harris (the 2015 first-rounder), Jordan Romano (a rock at double-A New Hampshire), Jacob Waguespack (acquired from Philadelphia for Aaron Loup), Corey Copping (acquired from the Dodgers for John Axford), Forrest Wall (acquired from Colorado in the Seunghwan Oh deal), Harold Ramirez, Kevin Vicuna and Max Pentecost. Not all will be added to the 40 and it’s possible another team could decide to select one of the unprotected players in the Rule 5 draft and keep them on their big-league roster the whole year (like the Blue Jays did with Joe Biagini in 2016). Top prospects like Vladimir Guerrero Jr., and Bo Bichette don’t need to be protected yet, but they’ll need to be added to the 40 in order to be placed on the 25-man roster. So eventually, they’ll displace someone, but not yet. 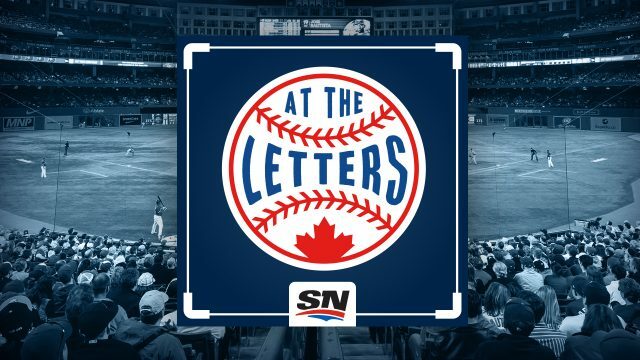 Taking Players Off The 40: Ultimately, the Blue Jays are going to have to take some players off the 40, both to accommodate their internal development and any free agents they sign or trade acquisitions they make. What some teams try to do is consolidate talent by swapping a handful of players for one or two players as a way to ease logjams. To this point, Atkins & Co., have been more in a talent acquisition mode, but they’ll need to do some serious asset management this winter. Those who can’t be traded can be designated for assignment, giving the Blue Jays 10 days to trade, release or assign a player. That process includes a trip through waivers and teams with some 40-man roster room like claiming players with options. Pitchers like Jose Fernandez, Taylor Guerrieri, Mark Leiter Jr., and Justin Shafer, and outfielders Jonathan Davis and Dwight Smith Jr., are among the September callups fighting to keep their place on the 40. Wither Pompey? : Of the current players on the 40-man roster, only two aren’t with the Blue Jays right now – Anthony Alford and Dalton Pompey. Alford is expected to join at some point, leaving Pompey, who has struggled through a variety of ailments the past three seasons and this year was suspended by the team after an angry dugout exchange with triple-A Buffalo manager Bobby Meacham. He’ll be out of options next spring and has been leapfrogged on the depth chart by several other outfielders on the roster, raising the question of how much longer the Blue Jays will continue to carry him, especially with so much pressure on the roster.